← Blessed by the rain – back in the saddle! Its -2 degrees and 300 riders gather atop a hillock outside Whitefield quietly willing the race brief to get on with it. In front of me are the green and white carbon rimmed cyclocross bikes of Team Hope, to my right is a Surly Pugsley and I’m pretty sure I saw a GT Aggressor somewhere. Tony turns round to me and asks “Is this going to be like Critical Mass?” I reply “Of course not – this is a race!” Half an hour later I’m not so sure as I am stuck in a single track traffic jam. 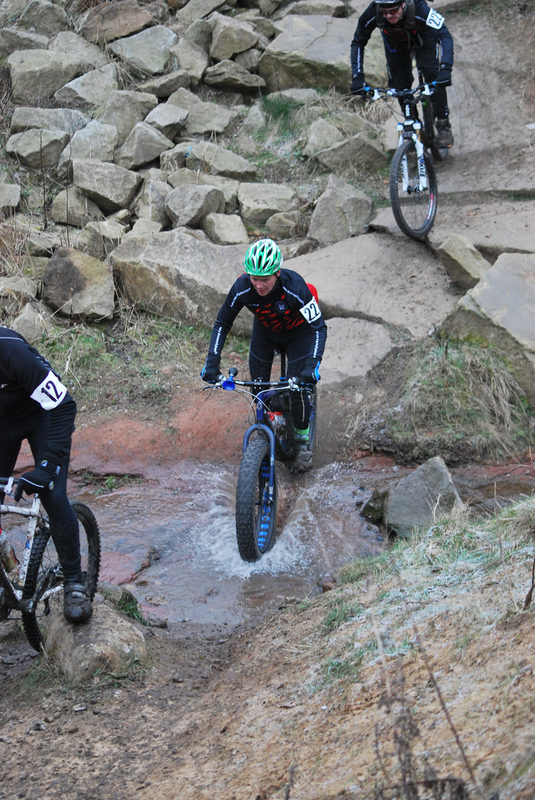 This is Hit The North – Manchester’s season opener for the MTB race season or the season finale for the cyclocross season depending on which side of the fence you sit. Rata Cycling Club’s racing division is today represented by me and Tony. Its Tony’s first ever race, I have a stinking head cold and did I mention the temperature? This does not bode well. It’s my second HTN – should’ve been my third but for having bust my wrist a year ago in similarly frozen conditions. The bikes are set up for the hard conditions and a prayer for grip is said. The course is a lesson in how to make the most of what you have, and features a decent amount of single track, a couple of cheeky MTB only lines through the woods, the obligatory carrying sections and ‘The Somme’. A 400 yard slog through a bumpy swamp that was not even worth attempting to ride followed by a very steep grassy climb. This was a deliberate attempt by the organisers to break people and speaking to Tony afterwards they almost succeeded. Thoughtfully though, they have placed a Samba band at the top of the climb which helped matters in my case at least. As the field spread out and everyone got on with the task in hand I found myself riding with a couple of cyclocross guys. The mix of cyclocross and MTB racers can make for odd bedfellows with each of us holding each other up on different parts of the course. We ride a couple of laps like this till we part ways and I find my pace matches the second of the two fat bikes in the race. I enjoy riding behind this guy as he is going great guns on his 42lbs rigid Surly. I ride a couple more laps on the wheel of the Surly till he drops me and I shift down a gear in anticipation of the end. Half way round my last lap I catch sight of some very fly looking bright green wheels to my left. Being a sucker for green anodising at the moment I enquire as to what they are? “Hope” come the reply. “How did you manage to get green Hope stuff?” said I, knowing it’s not available to Joe public. Turns out he is one of Hope’s sales guys so I quiz him for the rest of the way round about new products and what they are like to work for (fantastic by all accounts). By now the snow is starting to set in and I’m tempted to stick it out and do one final lap in the snow. However, at the top of the final climb I see a group of riders huddled in the bushes just out of sight from the finish line, all avoiding the dreaded extra lap. I hop of the bike and join them. A few minutes later the bell goes and everyone strolls over the line all casual like. Tony crossed the line a couple of minutes later cursing me for breaking our pact to ride together. Despite this, I get the feeling he enjoyed himself thanks to the fun course and friendly atmosphere. So another Hit The North draws to a close as the serious racers slugged it out for one final lap, the brass band played the racers home and a large queue began to form at the catering tent. This entry was posted in Biking, Cross Country. Bookmark the permalink.